Perfect for shade container gardening, this Begonia produces wonderfully full, apricot-orange blooms. The flowers cascade over each other and this begonia will put on a spectacular show in your garden. The Begonia "Splendide Ballerina Apricot" is to be grown in a hanging basket or pot. The bulbs are planted in spring and will bloom in mid to late summer. This begonia will produce many blooms that will cascade over the container it is growing in. Beautiful for any shady area in your garden. Gardeners in areas that receive a frost will want to dig the bulbs up at the end of the season store them for the winter. Growing Tuberous Begonias, a floral bonanza for shady areas. (See Combination Photo below.) Many gardeners consider these flowers the true aristocrats of the plant world. Once the treasured playthings of the very rich, these beauties are now easily available, and like most flowers with bulbous roots, are easy to grow. The bulbs are round and flat, sort of like a thickened cookie with a depression in the top. One of the great advantages of tuberous begonias is that they do best in the shade. Like our garden impatiens, tuberous begonias can add lavish color in shady spots under trees or in pots on the patio. They require rich soil and regular feeding, so if you plant them in the ground, be sure to prepare the soil carefully. Flower form. The most famous tuberous begonias, and certainly the most beautiful, are the camellia-flowered ones. One of the incredible bi-colored blooms plus a luscious white are shown in the large photo. 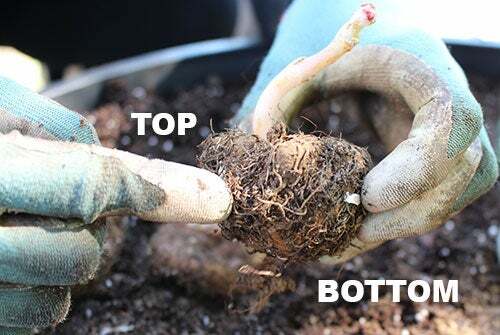 Photo A shows how many people plant several bulbs in a large pot. Photo B shows the spectacular result with a similar pot in full bloom. In fact, these 'bulbs' are perfect for containers and window boxes, as long as they're protected from the blazing sun. Photo C shows how beautifully they perform in low, shady borders. As you can see, the plants stay small, but the flowers are very large. In fact, your blooms may reach a spectacular 5" across with regular feeding. About 3-4" is the norm.